100% brand new and high quality Material: Gold plated Harry Potter Coindesign, both Souvenir Art & Collections, Business Gifts Holiday Decoration Gifts Diameter: 40mm Thickness: 3mm Color: Gold / Silver / Copper(We will Random Delivery) Quantity: 1 Note: Due to differences between different monitors, the picture may not reflect the actual color of the item. Thank you! The package includes: 3 x Harry Potter Coin (Plastic Box, Opp Bag Packing). These are very nice quality and better than I expected. The coins are metal and a good value. Look identical to the authentic coins I got encased. Got these for my daughter who loves Harry Potter as well and they're perfect! 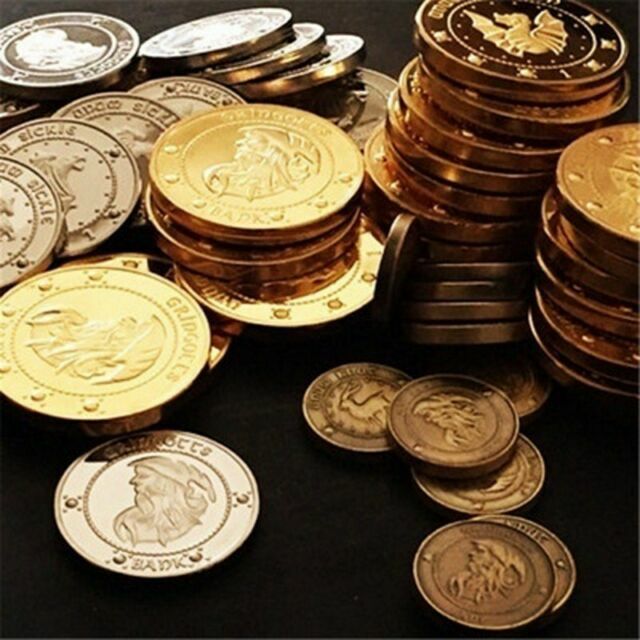 These are listed as Gringotts coins from the Noble Collection. Noble Collection coins are heavy and of very good quality. These are thin and very cheap-looking. I knew I was taking a risk, hoping for actual Noble coins at a low price. And I won’t necessarily say they’re overpriced at two bucks a set. But they are not Noble coins and should not be listed as such. I love these! I use them as props in my home Harry Potter display case, and they are PERFECT! The coins are a bit cheaper than the ones pictured and the design is hard to see but okay for price.